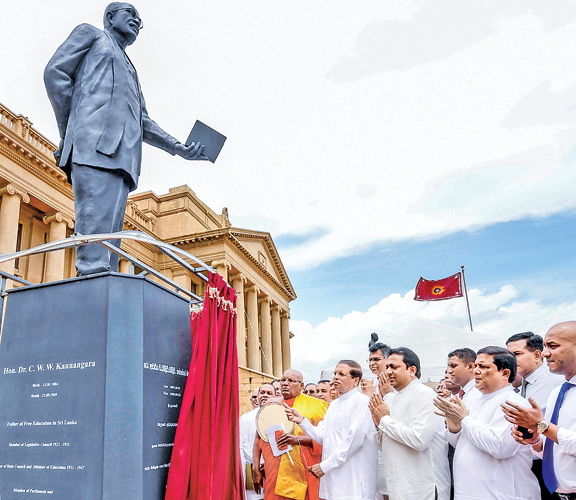 President Maithripala Sirisena yesterday unveiled a bronze statue of late Dr. C. W. W. Kannangara erected in the premises of the President’s Office in Fort. Dr. Kannangara who is known to be the Father of the Free Education system in the country functioned as the Education Minister of Ceylon from 1931-1947. Dr. Kannangara’s statue being erected beside other national heroes on the premises of the President’s Office is one of the greatest honours that can be bestowed to a citizen of the country. The task was made possible by the Central Colleges Past Pupils’ Association of Sri Lanka.